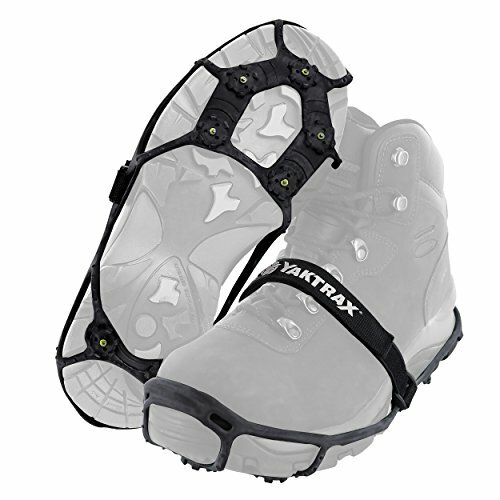 Yaktrax Spikes for Walking on Ice and Snow provide lightweight, low-profile spiked traction for light, casual use on slippery surfaces. Durable tungsten carbide spikes bite into ice, while molded rubber lugs offer additional traction on packed snow. There are seven points of contact on the cleats, providing heel-to-toe coverage. Natural rubber webbing stretches to fit most types of footwear, and remains elastic and durable even in sub-zero temperatures so that cleats are easy to take on and off regardless of the weather. A reflective performance strap runs over the top of footwear ensuring a comfortable, secure fit. Yaktrax Spikes are ideal for navigating icy sidewalks, driveways, and parking lots, and can fold to fit in a coat pocket, backpack, or purse. Available in two sizes to fit most shoes and boots (Yaktrax recommends adding one shoe size for regular boots and two shoe sizes for insulated boots): S/M (fits shoe size W5-9, M3.5-7.5), L/XL (fits shoe size W9.5+, M8-12). Sold as a pair.